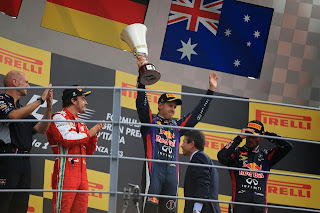 Twelve months ago F1 as a sport had its most important audition in a long while. And whaddaya know, it only went and nailed it. F1's final frontier. Its unfinished business. Its itch that it just can't scratch. Call it what you will, but it has applied to the sport's relationship with America for years and decades. F1 says it has a world championship, and indeed no season-long annual sporting event can be said to have the same global expanse. It also is not in the least bit shy of following the money. And yet for a generation or more it somehow has failed to establish a proper foothold in the world's biggest economy; indeed for much of that time the sport's turned its back on the place altogether. Despite repeated and varied attempts - some of which were successful only to be abandoned; others bordering on the cringeworthy - the rewards of the US market has always eluded F1 one way or another. The debut Austin Grand Prix of 2012 - no fewer than F1's US venue number 10 - was approached with some trepidation. There would have been plenty of this anyway given the regularity that the bold dreams of new rounds on the calendar, plenty of which have been in America, can evaporate. But in Austin's case it was stoked further by plenty of not-exactly encouraging noises coming out of the area - of delays (the race contract was even terminated for a while), financial problems, the forcible sidelining of Tavo Hellmund (to a large extent the driving force behind the project) and talk of environmental protests to name just a few - all of which were accompanied by a 'here we go again' feeling among F1 folk. But such doom-mongers couldn't have been more wrong. It transpired that the sport could hardly have selected a better place to host a Grand Prix. Austin as a city charmed the fraternity: eclectic, outward-looking and expressive, also as the self-styled 'Live Music Capital of the World' it was used to putting on large events and giving visitors a thoroughly warm welcome. It seems that cities of around one million inhabitants, such as Adelaide and Montreal, are just the right size to embrace a Grand Prix - big enough to host it; not too big so to dwarf it - and Austin appears just the latest. Even F1's most hardened cynical hacks agreed after the first visit that it was probably the most successful debut F1 event they could remember. Austin's Circuit of the Americas facility further is a fine one: the layout challenging, undulating and popular with fans and drivers alike. And not even the worries 12 months ago about a tepid race were borne out: we were treated to a tense, old-fashioned tête à tête over first place between two great drivers - in Lewis Hamilton and Sebastian Vettel - pushing to the limit throughout. In addition, there was ample wheel-to-wheel racing up and down the field; fears that the flowing first sector would split the field apart proved unfounded (Kimi even passed in it), and over and above the DRS zone there was also plenty of overtaking into turn one as well as some passing (rather BTCC reminiscent I thought) in the dog leg latter part of the lap too. Best of all, 120,000 were there on race day to see it all (and plenty were in attendance on the other two days), and I got the distinct impression that many of them will be back. Not even a clash with the NASCAR finale put a serious dampener on proceedings. It's hard to imagine how it all could have gone better. Of course, the 2012 event was just the beginning; what happens next - starting now - is crucial and F1 has had plenty of false dawns before. It's also shown an unhealthy tendency to blow a hole in its own foot in regard to races in the States. But it's tempting to think that F1 currently is giving itself its best ever chance of at last getting it right in the US. 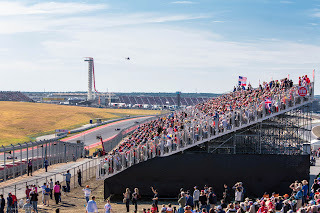 The circuit - as just about all Hermann Tilke-penned layouts have - has a something-of-everything quality, but in COTA's case it is taken to something of an extreme. Apparently the lap contains more corners at over 250 kph than Spa and more at less than 100 kph than the Hungaroring. And these bit of everything Tilkedromes tend to be Sebastian Vettel-Red Bull country. Not that the pairing really needs any assistance right now. F1 has entered one of those periodic states wherein it's divided into two classes, and moreover class A is made up of but one competitor. As has been the case since the summer, we disembark on a Grand Prix weekend full in the knowledge that only the very unusual will deprive Seb of a win, be it unreliability or some other form of major delay (yes dear reader, it's reached the point that not even a minor delay will keep Seb off the podium top step in all probability). Last year the tyres and surface were possibly the most influential players of all though. Pirelli erred on the side of caution as it often does at new venues and brought the two hardest compounds. The track was recently-laid which meant it still had a sheen of bitumen on the surface, resulting in a surface rather like driving on glass. Heating the tyres up, in particular warming up the fronts and rears in unison, became an acute challenge (Fernando Alonso especially struggled with this, which indirectly resulted in Massa's gearbox post-qualifying sabotage and all that). While lower tyre degradation, in part down to lower ambient temperatures than expected, meant that last year's race became almost an old-school Bridgestone era-type affair, with one-stop strategies all round and drivers able to push to the limit throughout. There was very little strategy variation although Jenson Button did benefit by being contrary and starting on the hard tyre, which helped him climb from twelfth on the grid (after technical troubles in quali) to finish fifth. This year, with the tarmac being less-recently laid and having been much more 'rubbered in' in the meantime, things should be less extreme. Just like last year though Pirelli is bringing the medium and hard compounds to Austin, which may well result in another Bridgestone-esque one-stopper fest. It'll also play yet further into Red Bull's hands, as for much of the year the biggest threat to the Bulls' supremacy has not come from another team or driver but from the tyres, and the extent that their tendency to degrade can slow down the Bull charge. Perhaps if you had to sum up the 2013 F1 season in four words, 'Red Bull versus Pirelli' wouldn't be the worst to choose, on a few levels. close can Mark Webber get to his team mate? 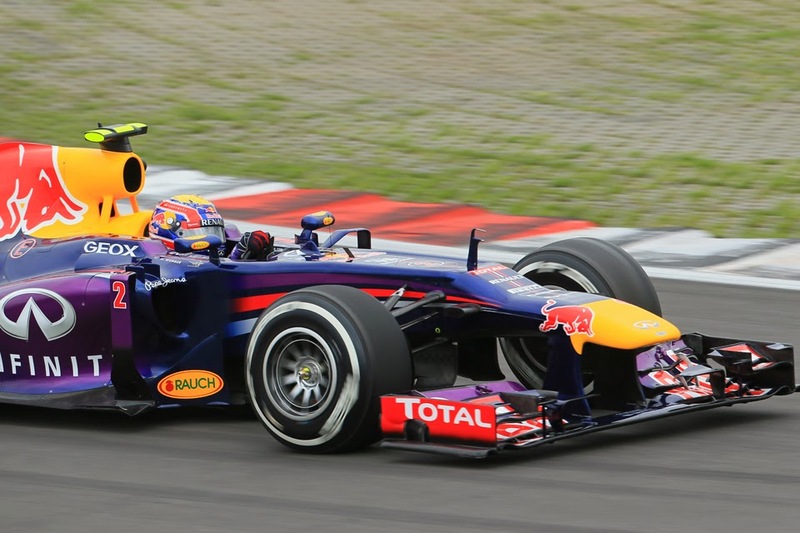 In these circumstances could Vettel have a threat from across the garage in Mark Webber? It's thought that the big difference between the two's results lays in Vettel's ability to get pace out of degrading tyres. Webber for once will be able to lean on his Pirellis. Cars that are strong aerodynamically will do well at Austin, and thus Lotus will be ones to watch, at least in the non-Seb race. In recent times Romain Grosjean has indeed been the most consistent in clinging to the Bulls' tails. What's more, even though he was going through something of a nadir this time last year he actually set the fourth quickest qualifying time before a grid drop for a gearbox change. And despite a spin in the race finished a mere six seconds after his team mate Kimi Raikkonen. As for Kimi himself, he in Abu Dhabi qualifying - armed again with a shorter wheelbase car - looked closer to his best, but word just received hot off the press is that - after apparently reaching a truce with Lotus for now over the payment kerfuffle - he won't be in Austin (or Brazil) after all, but due to having to undergo back surgery. Nico Rosberg is another who has been getting close (a strictly relative term) to the Red Bulls lately, so will worth keeping an eye on. But what about Lewis Hamilton, subdued in India and Abu Dhabi? Last year at this venue Lewis put in an excellent, charging drive; the only one able to face up to Vettel and indeed he was able to beat him - looking marginally the faster and he ambushed him for the lead after Seb was briefly delayed by a backmarker. Expecting him to do quite as much this time in his W04 probably is asking too much even of him though, but still it seems a good place for a bounce back. Felipe Massa like Grosjean did well here 12 months ago, looking quicker than Alonso for the most part, and these sort of Tilke tracks with lots of changes of direction are ones that Felipe tends to excel on (see Bahrain and Turkey). Plus, since he's officially been bid farewell by Ferrari he's displayed the freedom of the damned - a bit like a tennis player when two sets and a break down suddenly starts to loosen up and hit winners - and looked in a lot better form. It's timely too, as you feel that Ferrari needs both cars scoring if its going to salvage second place in the constructors' table from the season. You also feel that it needs a swing on Mercedes in Austin to achieve the same end. While Alonso as usual cannot be counted out - not on race day anyway - and is well-placed to tape up second place in the drivers' standings: with Kimi now out if he loses no more 16 points to Lewis then he'll be an official runner-up (but even had Kimi raced Alonso was looking well-placed on this). All in, we stand before a race weekend with the big prizes for the year already decided and apparently little doubt over what the result will be. But then again perhaps we shouldn't be too pessimistic - Austin has surprised us before after all.